But, I want to be able to add my custom fields so that they appear exactly below the "Biographical Info" box and above the "change password" field. 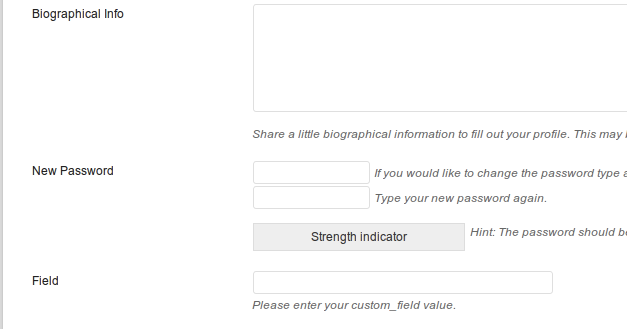 Everything I have read and tried places custom fields at the bottom of the page, but I want them to appear between the "Biographical Info" box and above the "change password" field. NOTE: The code below only display the fields but does not process any information or save the field values, because that part is same as described in the article linked in the question. Place the code below in your functions.php to display the fields. The above code will place your custom fields after the password fields. My advice is: Don't game/hack the system. Create content where the core devs want you to; the reason why you want to have the fields exactly there is probably not a good one for circumventing Wordpress' flow. Use the action hook profile_personal_options to put a new section for the settings you need on the page. This is not only technically sound but also clearer for users (that know what WP normally looks like). to keep the table aligned. Since you can't really do this, I would recommend using the Theme My Login plugin, a very simple member plugin which will just create "log-in", "log-out" and "profile" pages that will fit the customization of your theme. You'll be able to change the order of the fields as you wish in a distinct file that you can add in your child theme, so you won't have any trouble if something goes wrong. The only thing is that your profile won't be visible anymore at user-edit.php but at your-profile.php. Not the answer you're looking for? Browse other questions tagged custom-field users profiles or ask your own question. Extra profile field as select box? How to Save Different Usermeta Fields According to User Role?